Add fresh elements and aesthetics to outdoor seating with a multi-pedestal table. Innovative and modern, the free standing 6' and 8' steel multi-pedestal rectangular table is great for parks, schools, restaurants or dog parks. 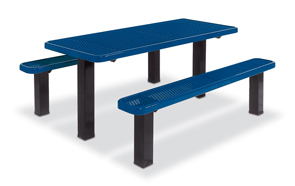 The low maintenance and lightweight expanded steel table is finished with a thermoplastic coating and the 4" square tube frame sealed with a powder-coating. These highly resilient finishes protect the table from harsh conditions and high volume use. Surface and in-ground mounting options available for this corrosive resistant, virtually maintenance free rectangular multi-pedestal table. Developed with user safety and convenience in mind, the expanded steel tables smooth, rounded edges with the frames featured non-trip, walk through design allows hassle free, comfortability to all individuals. An 8' ADA compliant multi-pedestal table allows full inclusivity that maximize usability to all with a single or double table overhang.